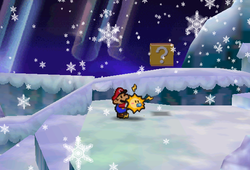 The Shiver Snowfield are three paths in the Shiver Region linking together Shiver City, Shiver Mountain, and Starborn Valley. 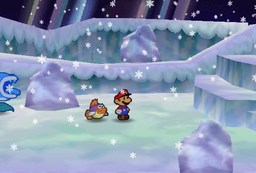 In Paper Mario, Mario needs to travel through here to eventually get to the Crystal Palace. A long line of snowmen in the center path guards the secret door into Shiver Mountain, the items needed to open the door are in the city and valley. Just before Starborn Valley, solar radiation resembling the Aurora Borealis (Northern Lights) can be seen in the sky. The path near the valley has Frost Piranhas, and after the player finished the chapter, Gulpits inhabit the path near the city. Jr. Troopa makes an appearance on the path. 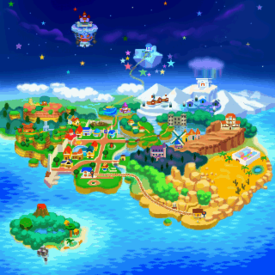 The in-game map description reads, "This icy snowfield links Shiver City with Starborn Valley. A path leads from the snowfield to Shiver Mountain. By going through the mountain, you can reach Crystal Palace." For enemy formations in Shiver Snowfield, see here. Star Piece Under a hidden panel in the south corner of the snowman scene. Letter Can be gotten by hammering a tree in the snowman scene four times. Behind an ice rock before the stairs to the Monstar fight. Repel Gel Behind a tree in the northeastern corner of the snowman scene. Stop Watch In a hidden block in the area where the Monstar fight takes place. Stop Watch In the area where Mario fights Monstar, going up the steps in the east to the high platform, the hidden ? Block is on the north-central area. Look at all those snowmen standing in a line. I wonder who made them... And why. They kind of look like they're watching the path. They look pretty cold, too...but I guess snowmen like cold. I think we're still on the path, but it feels more wild here. If we travel east from here, we'll hit Starborn Valley. Shiver City is way off to the west. The Star Piece in the snowman scene. The Star Kids revealing themselves after disguising as Monstar. This page was last edited on July 23, 2018, at 18:27.